Designing and building complex artifacts like simulation models often rely on the strategy of modularity. My main claim is that the validation of simulation models faces a challenge of holism because modularity tends to erode over the process of building a simulation model. Two different reasons that fuel the tendency to erosion are analyzed. Both are based on the methodology of simulation, but on different levels. The first has to do with the way parameter adjustment works in simulation; the second comes from how different groups of software programmers work together. 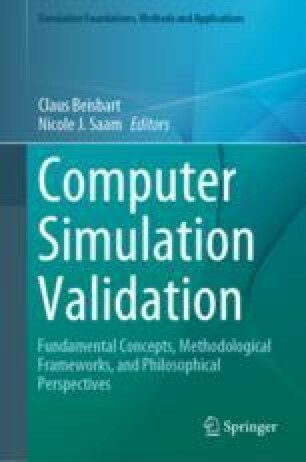 The chapter will conclude by drawing lessons about how holism challenges the validation of simulation and by discussing a corollary to conformational holism: the boundary between validation and verification tends to become blurred, thus undermining a strategy that insists on keeping them separate. This chapter looks back on a history of improvements. I would like to thank the reviewers of this volume for their helpful suggestions and the active audiences at the “How to Build Trust…” conference, Hanover 2015, and the PSA 2016 (whose proceedings include a shorter version of this paper). I also thank the DFG for funding under SPP 1689. Foote, B., & Joseph, Y. (2000). Big ball of mud. In H. Neil, F. Brian & R. Hans (Eds. ), Pattern Languages of Program Design 4 (= Software Patterns. 4). Addison Wesley, 2000. Retrieved July 25, 2018, from http://laputan.org/pub/foote/mud.pdf.